Believe it or not, the NFL draft is three weeks away. Since the last time we issued a mock draft roundup, the NFL’s free agency period began. The Minnesota Vikings didn’t necessarily make a big splash — mainly bringing back some players. They also added offensive lineman Josh Kline, but even so, mock drafters are still mainly stuck on the Vikings adding an offensive lineman in the first round. Just who that lineman will be, though, is up for debate. Of course, not everyone thinks Minnesota will take an offensive lineman with that top pick. Scroll down to check out all the prognostications. Note: Some drafts do more than one round. As always, when including a mock we used last time, we’ve also added the previous prediction so you can see how things changed (or not). 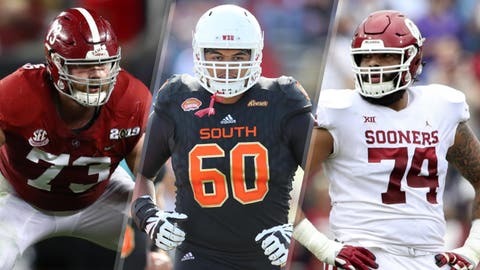 DraftTek (7 rounds): Round 1 — Noah Fant, TE, Iowa; Round 2 — J.J. Arcega-Whiteside, WR, Stanford; Round 3 — Elgton Jenkins, C, Mississippi State; Round 4 — Benny Snell Jr., RB, Kentucky; Round 6a — Mike Edwards, S, Kentucky; Round 6b — Jordan Ta’amu, QB, Mississippi; Round 7a — Jahlani Tavai, ILB, Hawaii; Round 7b — Chidi Okeke, OT, Tennessee State. Previously: Round 1 — Christian Wilkins, DL, Clemson; Round 2 — Chris Lindstrom, G, Boston College; Round 3 — Terrill Hanks, OLB, New Mexico State; Round 4 — Terry McLaurin, WR, Ohio State; Round 6a — Ugo Amadi, S, Oregon; Round 6b — Paul Adams, OT, Missouri; Round 7a — Nate Harvey, DE/OLB, East Carolina; Round 7b — Donald Parham, TE, Stetson. Robert Klemko of SI.com: Cody Ford, OL, Oklahoma. Luke Easterling of The Draft Wire (4 rounds): Round 1 — Cody Ford, OL, Oklahoma; Round 2 — Dre’Mont Jones, DL, Ohio State; Round 3 — Juan Thornhill, S, Virginia; Round 4 — Dru Samia, OL, Oklahoma. Previously: Round 1 — Ford; Round 2 — Jones; Round 3 — Terrill Hanks, LB, New Mexico State; Round 4 — Nate Davis, OL, Charlotte. John Clayton of the Washington Post: Cody Ford, OL, Oklahoma. “The Vikings’ mission in the draft is simple: Draft the best offensive lineman available. Ford can help them as a guard or a tackle.” Previously: Greg Little, OT, Mississippi. Eddie Brown of the San Diego Union-Tribune (3 rounds): Round 1 — Cody Ford, OG, Oklahoma; Round 2 — Dre’Mont Jones, DT, Ohio State; Round 3 — Devin Singletary, RB, FAU. Previously (2 rounds): Round 1 — David Edwards, OT, Wisconsin; Round 2 — Oshane Ximines ,OLB, Old Dominion. Don Banks of Patriots.com: Andre Dillard, OT, Washington State. “I’m old enough to remember when the Vikings had a Pro Bowl-studded offensive line and didn’t seem in perpetual need at the position. (Yeah, I know, it was in the late ‘90s. But like I said, I’m old). Dillard is a strong pass blocker who can start as a rookie tackle and his athleticism should allow him to refine his run blocking skills once he’s in the NFL.” Previously: Cody Ford, OL, Oklahoma. Chad Reuter of NFL.com (4 rounds): Round 1 — Chris Lindstrom, OG, Boston College; Round 2 — Charles Omenihu, DE, Texas; Round 3 — Deionte Thompson, S, Alabama; Round 4 — Bryce Love, RB, Stanford. Previously: Round 1 — Ed Oliver, DT, Houston; Round 2 — David Edwards, OT, Wisconsin; Round 3 — Chauncey Gardner-Johnson, S, Florida. Dan Kadar of SB Nation: Andre Dillard, OT, Washington State. “Drafting a true offensive tackle like Dillard would move veteran Riley Reiff to the inside. That might be the smarter move for Minnesota than taking a guard like Chris Lindstrom of Boston College. Reiff should be able to handle the move and upgrade the run blocking while Dillard can be a long-term fix for pass protection.” Previously: Clelin Ferrell, DE, Clemson. Walter Cherepinsky of WalterFootball.com (6 rounds): Round 1 — Cody Ford, OL, Oklahoma; Round 2 — Germaine Pratt, LB, NC State; Round 3 — L.J. Collier, DE, TCU; Round 4 — Trysten Hill, NT, UCF; Round 6a — Dax Raymond, TE, Utah State; Round 6b — Jordan Scarlett, RB, Florida. Previously (5 rounds): Round 1 — Jonah Williams, OT, Alabama; Round 2 — Germaine Pratt, LB, NC State; Round 3 — Collier; Round 4 — Gerald Willis, DT, Miami. Pro Football Focus (Steve Palazzolo and Mike Renner alternating picks): Andre Dillard, OT, Washington State. Doug Farrar of the Touchdown Wire: Andre Dillard, OT, Washington State. “Whatever the Vikings do on offense with Kirk Cousins—and they’re always going to find limitations in that—their passing offense will be far more limited if Cousins doesn’t have enough protection to stay on script. Dillard needs to develop power as a run-blocker, but as a blindside protector, he has everything you want—from the quickness to snap and adjust to edge-rushers, to the intelligence and fast-twitch reflexes to take on games and stunts.” Previously: Greg Little, OT, Mississippi. Charles Davis of NFL.com: T.J. Hockenson, TE, Iowa. Will Brinson of CBSSports.com: Jonah Williams, OL, Alabama. “The Vikings need help on the offensive line and they also want to run the ball, what better way than to add a former Nick Saban standout and a guy who surprisingly fell this far given earlier placement in most mocks.” Previously: Cody Ford, OL, Oklahoma. Ryan Wilson of CBSSports.com (3 rounds): Round 1 — Cody Ford, OL, Oklahma; Round 2 — Jeffery Simmons, DT, Mississippi State; Round 3 — J.J. Arcega-Whiteside, WR, Stanford. Previously (1 round): Garrett Bradbury, C, NC State. Charlie Campbell of WalterFootball.com (4 rounds): Round 1 — Jonah Williams, OT, Alabama; Round 2 — Garrett Willis III, DT, Miami; Round 3 –Michael Jordan, G/C, Ohio State; Round 4 –Jarrett Stidham, QB, Auburn. Previously: Round 1 — Williams; Round 2 — D’Andre Walker, DE/OLB, Georgia; Round 3 –Isaiah Buggs, DT, Alabama; Round 4 — Stidham. Justin Rogers of the Detroit News: Jawaan Taylor, OT, Florida. Previously: Cody Ford, OL, Oklahoma. John McClain and Aaron Wilson of the Houston Chronicle: McClain: Byron Murphy, CB, Washington; Wilson: Devin Bush, LB, Michigan. Previously: McClain — Dalton Risner, OT, Kansas State; Wilson — Murphy. Mark Mosher of Pro Football Weekly: Cody Ford, OG, Oklahoma. Eric Galko of Optimum Scouting: Noah Fant, TE, Iowa. Bryan Fischer of Athlon Sports: Josh Jacobs, RB, Alabama. Previously: Dexter Lawrence, DE, Clemson. Rick Serritella of NFLDraftScout.com: Christian Wilkins, DT, Clemson. MyNFLDraft.com: Christian Wilkins, DT, Clemson. Brad Biggs of the Chicago Tribune: Cody Ford, OL, Oklahoma. Mark Inabinett of al.com: Jonah Williams, OT, Alabama. Clint Lamb of Athlon Sports (3 rounds): Round 1 — Cody Ford, OL, Oklahoma; Round 2 — Dre’Mont Jones, DL, Ohio State; Round 3 — Josh Oliver, TE, San Jose State. Scott Wright of Draft Countdown: Andre Dillard, OT, Washington State. Chris Trapasso of CBSSports.com (2 rounds): Round 1 — Garrett Bradbury, C, NC State. “Pick an offensive line position, and the Vikings could upgrade that spot. Bradbury has elite movement skills at center.”; Round 2 — Kelvin Harmon, WR, NC State. Previously (1 round); Dalton Risner, OT, Kansas State. Nick Klopsis of Newsday: Jonah Williams, OT, Alabama. Previously: Cody Ford, OL, Oklahoma. Kevin Hanson of edsfootball.com (3 rounds): Round 1 — Cody Ford, OL, Oklahoma; Round 2 — Dre’Mont Jones, DT, Ohio State; Round 3 — Lonnie Johnson, CB, Kentucky. Alex Khvatov of NFL Draft Blitz: Jonah Williams, OT, Alabama. Previously: Cody Ford, G, Oklahoma. Sean Wagner-McGough of CBSSports.com: Cody Ford, OT, Oklahoma. Previously: Ford. Jonas Shaffer of the Baltimore Sun: Andre Dillard, OT, Washington State. Final tally: As mentioned above, offensive linemen were a popular choice for Minnesota’s first-round pick. Once again, Cody Ford garnered the most selections, this time with 12. Andre Dillard was chosen seven times and Jonah Williams five. But the other two players who were picked twice were not offensive linemen — Noah Fant and Christian Wilkins. One more reason to love mock draft season.